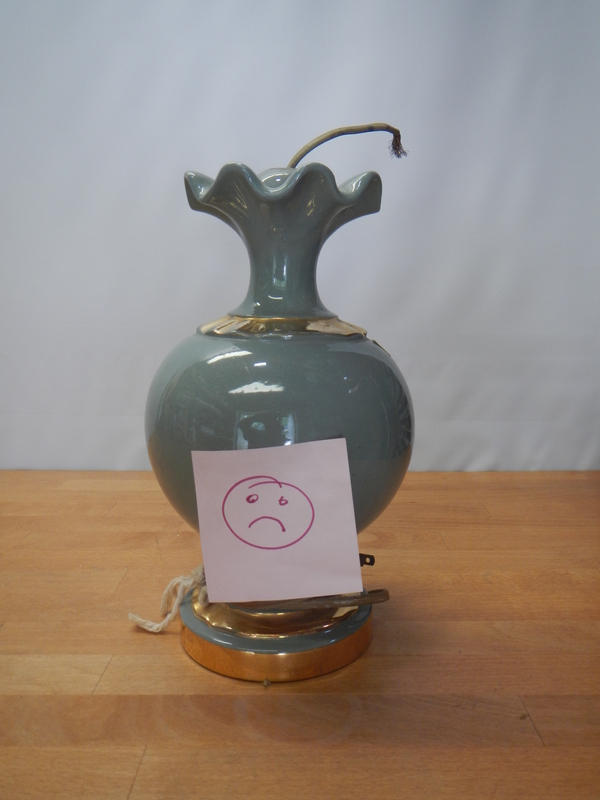 We ran across this sad little green vase lamp a couple of weeks ago. Fortunately the vase was in good shape, even though everything else was gone. The vase did have some markings but nothing that I could source back to its origin. For the most part, you would have found this in a parlor in the 30’s and 40’s, possibly on top of a free-standing radio. It stands about 11 inches without the lamp hardware. The first picture is before we started. Follow the story to see where it goes. Lamp Assessment: The vase lamp was intact, and there was a little wear on the gold leaf but not enough to be an issue. All the lamp parts were gone and I think they left the cord in the base just so someone would recognize it as a lamp. Disassembly: There really wasn’t much to disassemble on this one, since most everything was gone as the neck, harp and fixture switch was already gone. The designer was not involved in this one, so I am operating without a net. This should be a fairly easy restoration to get it back in service. The cleaning and polishing proceeded as expected. The ceramic finish was durable and it just took a good cleaning. I added a cord bushing at the base of the lamp and a new felt bottom to the base so the ceramic surface would not scratch a desk top. As you can see in the final picture, it looks like a real lamp!! I also added a small finial. Another survivor project, as it turned out to be a nice functional, safe working lamp that will give many more years of service. This was a “like new” restoration, and we started with a good patient as the lamp vase body was in good shape, it just need new hardware and wiring. Shortly after I finished this one, I noticed it gone from the shelf, figuring it got sold. Ended up, my daughter took a fancy to it, so it is now at her house. 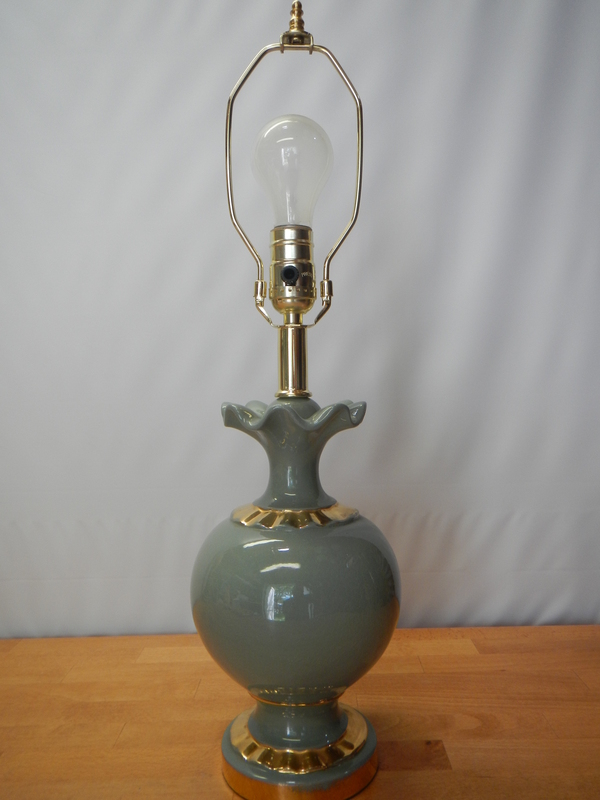 If you have an old lamp on its last leg, let us help you bring it back to life or give it a new home. Call us or email us with you next lamp project. This entry was posted in Lamp Restoration Projects and tagged broken lamp, dallas lamp repair, fix lamp, lamp repair, lamp restoration, rewire lamp. Bookmark the permalink.